24mm (36mm equiv. ), f/4.5, 1/80s, ISO 100. This image has been modified. Click for original image. Click here for the RAW file. In early February, Tamron announced a pair of new lenses, one of which was a successor to their Tamron 10-24mm f/3.5-4.5 Di II LD SP AF lens. The new version, called the Tamron 10-24mm f/3.5-4.5 Di II VC HLD, includes a number of improvements to construction, optical quality and usability. I tested the new Tamron 10-24mm f/3.5-4.5 Di II VC HLD lens with a Nikon D500 and put it through its paces primarily as a landscape lens, which I consider to be one of the best uses for this focal length range. Let's see how it fared! The Tamron 10-24mm f/3.5-4.5 VC looks a lot different than its predecessor. It's just this reviewer's opinion, but the new version looks much more polished and higher-end that the earlier version. It isn't just aesthetics either, functionally there are important differences to the new 10-24mm's design. The new 10-24mm f/3.5-4.5 has a windowed focus scale rather than the painted numbers at the end of the lens on the previous version. The Di II VC HLD lens has a soft matte finish that feels very nice and looks great too. It is a fairly compact, but solid, zoom lens -- length is slightly over three inches long, maximum diameter is around 3.3 inches (83.8 millimeters), and features a 77mm filter thread. The lens weighs 15.5 ounces (440 grams) regardless of the selected lens mount. The lens has a moisture-resistant construction with seals throughout the lens barrel, including around the mount, which is particularly important for keeping your gear in working condition while shooting in tough environments. The lens also comes with a screw-on lens hood which attaches and detaches easily while doing its job well, so no complaints there. Although dependent on your camera of choice, I found that the 10-24mm balanced well on my Nikon D500. The zoom ring is located near the end of the lens barrel and has a textured rubberized finish. It rotates smoothly and is plenty wide. The focus ring is closer to the camera body and is very narrow. The windowed focus distance area is nice, but I didn't love the feel of the focus ring because it felt somewhat loose to me. With that said, it is possible to make minute, precise adjustments to the focus, which is good. On the left side of the lens barrel there are a pair of switches, one for switching between autofocus and manual focus and the other for enabling or disabling the vibration compensation. Overall, the lens handles well and feels great in the hands. I particularly like the zoom ring, which simply put has a high-end feel. The Tamron 10-24mm lens has been designed to offer "vastly improved optical performance" compared to its predecessor. Part of that goal involves the introduction of a new large aperture aspherical lens and low dispersion (LD) element. Other special elements include a molded glass aspherical element, a hybrid aspherical lens and an eXtra Low Dispersion (XLD) element. The lens includes Tamron's Broad-Band Anti-Reflection Coating (BBAR) to improve the optic's light transmission and suppress reflections and dispersion across the lens' surface. Further, the lens includes fluorine coating to help repel water and oils and make the lens surface easier to clean. The Tamron 10-24mm f/3.5-4.5 Di II VC HLD is a pretty sharp lens, especially considering its focal length range and price. Its center performance is particularly impressive, while the edges do suffer quite a bit, especially when shooting wide open. When shooting at 10mm with an aperture of f/3.5, the closer your subject, the more performance falls off in the corners. For example, look at the center sharpness below of a subject a few feet from the lens, then check the 100 percent crop of a corner below it. That's a dramatic decrease in sharpness. 10mm (15mm equiv. ), f/3.5, 1/320s, ISO 100. 100% crop from the center of an unedited JPEG image shot with the above settings. Click for full-size image. Click here for the RAW file. 100% crop from the top left corner of an unedited JPEG image shot with the above settings. Click for full-size image. Click here for the RAW file. In the RAW image, notice too that there is higher chromatic aberration in the corner than in the center of the frame. Stopping down does help, but by the time the corner sharpness is what I'd consider acceptable, diffraction is rearing its ugly head. On the topic of diffraction, it appeared to start around f/11 in my test images. Further, there is quite a bit of distortion at 10mm (15mm equivalent), especially when looking at RAW files. RAW file of the test image above converted to a JPEG file using default Adobe Camera Raw settings. Click for full-size image. Click here for the RAW file. Note that the lines in this image were not perfectly straight in reality, but you can still see quite significant bowing in what were nearly straight lines. Note also the vignette, which I'll discuss further in the next section. At 24mm (36mm equivalent), the Tamron 10-24 delivers pretty good performance across the entire frame, even when shooting a close subject. However, you do need to stop the lens down to at least f/8. And as I mentioned above, f/11 starts to show some signs of diffraction, but at 24mm, it's not too bad until you get beyond f/16. 24mm (36mm equiv. ), f/8, 1/40s, ISO 100. 100% crop from the top left corner of an unedited JPEG image shot with the above settings. Click for full-size image. Click here for the RAW file. When photographing subjects further away, the situation is similar, but it is not always as apparent. In the 10mm (15mm equiv.) test shot below, much of the frame looks great but the bottom corners still exhibit disappointing performance. 10mm (15mm equiv. ), f/3.5, 1/800s, ISO 100. Full test scene. Click for full-size image. Click here for the RAW file. 100% crop from the center of the above unedited JPEG image. Click for full-size image. Click here for the RAW file. 100% crop from the bottom left corner of the above unedited JPEG image. Click for full-size image. Click here for the RAW file. The grass in the corner of the image is far enough away that depth of field can't explain the softness given the focal length and the focus distance. At 15mm, the performance across the frame is slightly better, but the corners are still a problem. The same remains true at 24mm, although again, performance is a bit more consistent. Overall, the Tamron 10-24mm is not going to blow you away with its sharpness performance, but when considering what it offers for focal length range and its price point, it's a decent lens. At 10mm, there is noticeable vignette until you stop down to f/8. At f/3.5, it is very apparent, but it might not be noticeable when shooting some subjects. If you're shooting landscapes where there will be a lot of visible sky, then I recommend stopping down to at least f/8 to deal with the falloff. 10mm (15mm equiv. ), f/3.5, 1/1250s, ISO 100. Vignette test. Resized JPEG image. Click for full-size image. Click here for the RAW file. 10mm (15mm equiv. ), f/8, 1/250s, ISO 100. At 24mm, the falloff is again basically gone by f/8, but it is not quite as pronounced when shooting wide open as it is at 10mm. 24mm (36mm equiv. ), f/4.5, 1/640s, ISO 100. Vignette test. Resized, but otherwise unedited, JPEG image. Click for full-size image. Click here for the RAW file. The new Tamron 10-24mm has been designed to offer improved resistance to flare and ghosting compared to its predecessor. I have not used its predecessor, but the new 10-24mm HLD lens does a great job resisting flare. I had to go out of my way to create lens flare. 10mm (15mm equiv. ), f/3.5, 1/2000s, ISO 100. Lens flare test. Resized, but otherwise unedited, JPEG image. Click for full-size image. Click here for the RAW file. 10mm (15mm equiv. ), f/22, 1/40s, ISO 100. Chromatic aberrations are very well controlled by the Tamron 10-24mm lens. I was very impressed with how well it handled both chromatic aberrations and purple fringing, however there are some issues with chromatic aberration when shooting wide open in the corners. Below are a series of 100% crops from RAW images processed with Adobe Camera Raw defaults, but no lens corrections. Further, there are two crops of processed RAW images with default Adobe Camera Raw lens corrections enabled. See the image captions for additional information. 10mm (15mm equiv. ), f/3.5, 1/1000s, ISO 100. Chromatic aberration test. 100% center crop from a RAW file processed with Adobe Camera Raw default settings and exported as a JPEG file. Click for full-size JPEG image. Click here for the RAW file. Chromatic aberration test. 100% top right corner crop from a RAW file processed with Adobe Camera Raw default settings and exported as a JPEG file. Click for full-size JPEG image. Click here for the RAW file. Chromatic aberration test. 100% top right corner crop from a RAW file processed with Adobe Camera Raw default settings and lens corrections applied and exported as a JPEG file. Click for full-size JPEG image. Click here for the RAW file. In the series of crops above, all originally from a RAW file captured at 10mm (15mm equiv.) with an aperture of f/3.5, we can see that the center of the frame looks good. It has nice detail and no problems with chromatic aberration. However, the second crop, from the top right corner of the RAW file, shows considerable chromatic aberration. There are also issues with blur and vignette, as I have already discussed. In the third crop, it is evident that default ACR lens corrections help with the vignette, but there is still some visible chromatic aberration. Is this problem solved by stopping the lens down? Let's see. 10mm (15mm equiv. ), f/8, 1/160s, ISO 100. In addition to reducing chromatic aberration in the corners, stopping the lens down also greatly alleviates falloff for sharpness and brightness. Further, Adobe Camera Raw lens corrections do a better job dealing with chromatic aberration in the image captured at f/8. Despite being a wide angle lens, the 10-24mm VC can still offer a very soft background in the right conditions. 24mm (36mm equiv. ), f/4.5, 1/200s, ISO 100. 24mm (36mm equiv. ), f/4.5, 1/160s, ISO 3200. While I like the background in the two shots above and think that the 10-24mm does a great job of creating subject separation considering its focal length and aperture, it is important to note that you have to be very close to your subject for this to work. The new High/Low torque-modulated Drive (HLD) autofocus system worked very well when paired with my Nikon D500. Autofocus performance proved quick across the focal length range. The lens is not silent, but it is fairly quiet. The lens also includes full-time manual focus override too, which is nice. With a maximum magnification ratio of 1:5.3, the Tamron 10-24mm HLD lens is certainly not a macro lens. As you can see in the images below, it can still work okay for photographing larger subjects up close. The close focus distance, by the way, is 9.4 inches (0.24 meters). 10mm (15mm equiv. ), f/3.5, 1/250s, ISO 400. Close focus distance at 10mm. Click for full-size image. Click here for the RAW file. 24mm (36mm equiv. ), f/4.5, 1/100s, ISO 400. Close focus distance at 24mm. Click for full-size image. Click here for the RAW file. As I noted, the 10-24mm is not a macro lens, but it did a good job of photographing flowers nonetheless. In the shot below, the flowers were not particularly large, but the 10-24mm was able to get right in there and capture a nice image. 24mm (36mm equiv. ), f/4.5, 1/100s, ISO 1400. This image has been resized. Click for full-size image. Click here for the RAW file. During real world shooting with the new Tamron 10-24mm f/3.5-4.5 Di II VC HLD lens, I was impressed with its overall performance and versatility, particularly as a landscape lens. Stopping the lens down, as I often do when shooting landscapes, allowed the lens to put its best foot forward. It is nice to be able to have access to the ultrawide 15mm equivalent focal length (16mm equivalent on Canon APS-C cameras due to the 1.6x crop factor of Canon APS-C cameras) while still being able to zoom into a 36mm equivalent (38.4mm equivalent on Canon) focal length for situations in which I don't want a very large field of view. Before concluding this Field Test, I want to share a selection of images I shot with the Tamron 10-24mm lens. 10mm (15mm equiv. ), f/4.5, 1/10s, ISO 100. This image has been modified. Click for original image. Click here for the RAW file. The Tamron 10-24mm's VC works well. Even when hunched over and not utilizing perfect lens holding technique, I was still able to capture a sharp image at a shutter speed of 1/10s. 13mm (19mm equiv. ), f/13, 6s, ISO 100. 10mm (15mm equiv. ), f/16, 6s, ISO 100. 19mm (28mm equiv. ), f/8, 3s, ISO 100. 10mm (15mm equiv. ), f/8, 2s, ISO 160. 24mm (36mm equiv. ), f/4.5, 1/800s, ISO 720. 24mm (36mm equiv. ), f/11, 1/30s, ISO 100. The Tamron 10-24mm f/3.5-4.5 Di II VC HLD lens is an affordable ultra-wide zoom lens for APS-C cameras that offers good image quality, particularly in the center of the frame. To be able to get good corner performance, particularly when shooting at 10mm, you need to stop the lens down. Of course, sharpness needs to be kept in context, and the fact is that the Tamron 10-24mm looks good, feels good and works well while priced right around US$500. For users looking for an affordable ultra-wide APS-C zoom lens, the new Tamron 10-24mm is well worth a look. 10mm (15mm equiv. ), f/13, 25s, ISO 800. (From Tamron lens literature) Tamron, a leading manufacturer of optics for diverse applications, announces the launch of 10-24mm F/3.5-4.5 Di II VC HLD (Model B023), a new ultra-wideangle zoom lens for APS-C DSLR cameras. The lens is expected to be available in the U.S. this Spring at $499. Model B023 is a wide-angle zoom lens that covers an exceptionally large range -- the largest focal length range in its class1 (35mm equivalent is 16mm to 37mm). The lens is ideal for street photography, landscapes, group photos and casual everyday scenes. In 2008, Tamron launched the SP AF 10-24mm F/3.5-4.5 Di II LD Aspherical [IF] (Model B001) that provided an unprecedented focal length range in its class. Building on that lens's popularity, the successor Model B023 has improved optical performance and new features. It embodies Tamron's most advanced technologies, including the VC (Vibration Compensation) system, Moisture-Resistant Construction and Fluorine Coating, and the first implementation of Tamron's new HLD (High/Low torque modulated Drive). Additionally, the Model B023 has a refreshing new design derived from the design of the new product lineup in the SP series. The new Model B023 achieves a broad focal length range of 10-24mm, the largest range among ultra-wideangle zoom lenses for APS-C DSLR cameras. This is the 35mm equivalent of covering a very wide-angle of view, from 16mm ultra-wideangle to 37mm semi-wide-angle. A photographer can enjoy diverse wide-angle expressions with just this one lens, from dynamic landscapes far beyond the normal human field of vision to simple, casual snapshots. The optical design of the new Model B023 consists of 16 lens elements in 11 groups. Special lens elements are utilized in an optimum configuration of one LD (Low Dispersion) lens element, one XLD glass element, one molded glass aspherical element, and one hybrid aspherical lens. While curbing an increase in the size of the optical system, the new lens very effectively compensates for a wide variety of aberrations in the entire zoom range, including transverse chromatic aberration, comatic aberration and distortions that tend to become more prominent with a wide-angle lens. Tamron's new HLD (High/Low torque modulated Drive) has been developed for use as the AF drive system for Model B023. With its outstanding driving power and stability, the HLD is capable of smoothly controlling the AF mechanism of the new Model B023 that is actually equipped with large focusing lens elements. When shooting in AF mode, the Full-time Manual Focus override allows you to instantly make fine focusing adjustments manually, without having to switch between modes. While inheriting the design that makes use of a lot of organic curves and the delicately polished form down to fine details that characterize the SP lens series, the new Model B023 comes with a highly sophisticated design that also places much importance on the lens's functionality and ease of use, featuring an overall form that faithfully encompasses the internal structures within, a slim Luminous Gold brand ring, the switch shape and the distance-scale window design. 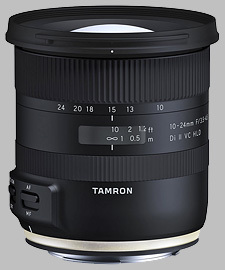 The Tamron 10-24mm f/3.5-4.5 Di II VC HLD doesn't have any user reviews yet!